Competitors customers are your customers. Sounds controversial? Might be. But see it from a different perspective. From the problem perspective. Competitors customers have the same problem you're solving. Right? Therefore they are your customers. Even though currently they are using different solutions. So what? - you ask. Well, first of all, listen to those people. Your main goal is to understand why are they using not your solution. More features? Better UX? A habit? Better price? Better customer support? Coz their wife told them so? Options are countless. One is definite: if you ignore competitors customers in your market research - you'll lose a huge learning opportunity. Additional benefit? Learn the language your competitor is using to convince their customers. Is it different to yours? Why might customers understand it better than yours? How to reach your competitor's customers? "Eat your own dog food" is a known concept in product development. If you don't use your own product - why others should? To learn why customers might choose your competitor over you - go and use their product. Experience their customer journey. Are your customers sharing their opinions about your product? If yes then they would probably do the same about your competitor's products. Go where opinions are and listen. It could be an online resource (forum, review site, social network) or an offline event (conference, industry event, meetup). There are very clever research agencies. Ones you go to when you don't have time or skills to do the research yourself. Those guys can find you precisely those people who you need. Such agencies will not be surprised if you ask them to find and study your competitor's customers. Be prepared to pay a premium for such services. You're not there to convince them to abandon your competitor. You are there to learn why they've chosen your competitor. You're there to understand their buying process. Ask if they're satisfied with their current solution. Rarely everyone is fully happy. Note down every word they say. You may find things that will help you make your own product better. Things that will allow you to differentiate yourself. Your competitor's customers are your customers because they have the problem you're solving. 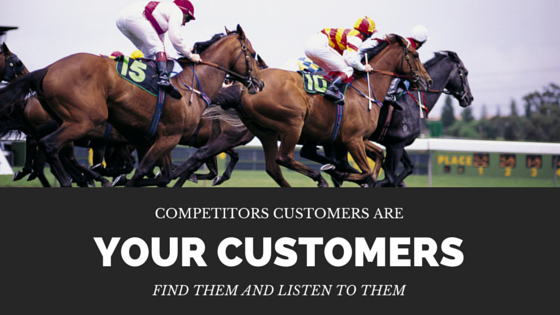 You need to listen to competitors customers in order to make your solution better. There are ways to reach your competitor's customers, paid and free. While talking to them: don't sell, ask about current solutions, understand buying process and figure out their accepted switching costs.